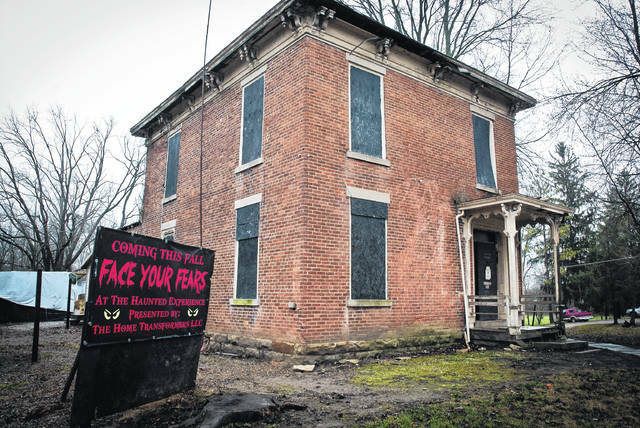 The old Haunted Hoorah’s days are numbered as it sits and waits for the new property owners to come and demolish it to make room for the new Buckeye Valley East Elementary complex. Jurors awarded the former owners, Brent and Angela Stooksbury, $229,000 to be paid by the Buckeye Valley Local School District. A Delaware County jury has decided the Buckeye Valley Local School District must pay Brent and Angela Stooksbury $229,000 for their property — known as the Haunted Hoorah — at 530 E. High St. in Ashley. Buckeye Valley Local School District filed an eminent domain petition with the Delaware County Common Pleas Court in January to appropriate the property next to Buckeye Valley East Elementary. Brent Stooksbury, 47, said it appeared that the jury shot down the middle to make it fair for them and the school district, and he said he was happy with the verdict. The Stooksburys purchased the property as a foreclosure in 2013 for $11,000, which their independent appraiser valued recently at $330,000. The couple was asking the school district for $350,000. The school district’s appraiser valued the property at $100,000, which the district offered to the Stooksburys. Before the jury deliberated, they were instructed by Delaware County Common Pleas Court Judge David Gormley to consider and award the Stooksburys an amount based on what they believed to be the fair market value of the property. In further instructions, he told the jury they were not to consider the Stooksbury’s purchase price because it was a foreclosure sale and not an open market purchase. They were to consider a value equal to today’s market. Brent Stooksbury said they needed the outcome of the trial so they could move forward. “I’m okay. We’ll take what we got and build the best damn haunt in Ohio,” he said. However, on the other side of the verdict, Andrew Miller, Buckeye Valley Local School District superintendent, said he thought the jury took it very seriously, and he was satisfied with the verdict. Miller, like the Stooksburys, said he was happy now that the district could move forward and keep the project on schedule. He said there is still some debate on when the Haunted Hoorah will be torn down. District officials contend that the property is necessary to complete the construction of the elementary school complex that is currently under construction. A portion of the west wing of the building will be located on the former Haunted Hoorah property as well as the bus loop. Miller said the bus loop is an important part because it allows access to the school from the east and keeps the bus and car traffic separate, allowing for better student safety during drop-off and pick-up times. He said the purchase of the property is included in the construction budget. According to district officials, the projected cost for the elementary building is $11.6 million, which is designed to serve 475 students. A portion of the old school building is being renovated and incorporated into the new building. The project is funded by a $31.25 million bond issue that passed by two votes in November 2015. Brent Stooksbury said he didn’t want to give anything away yet, but he and his wife have their eyes on a couple of properties in Ashley for the new Haunted Hoorah. He said that last October was the fourth season for the attraction that employed 118 seasonal workers and drew approximately 8,000 visitors to Ashley. They hope to continue with the attraction, and make it bigger and better than before. This entry was tagged Buckeye Valley Local School District, D. Anthony Botkin, Gormley, Haunted Hoorah, Miller, Stooksbury. Bookmark the permalink.